It had been the coldest winter in years. The frost lay thick and mysterious on the ground. The trees were ornate jewels fringed with delicate white lace as I headed out of Ipswich on the train and up the East Suffolk Line. It was like escaping into Narnia. As I cycled west from Saxmundham station, it began to snow, powdery at first, and then large flakes billowing down out of the invisible sky. A gleaming jewelled dust coated the hedgerows and fields. 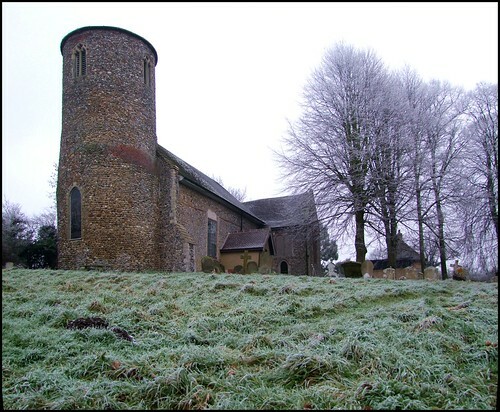 It was exciting: I was heading into the narrow winding lanes and rolling hills of High Suffolk, with its secretive villages and pretty little churches. Beyond Sweffling, the snow stopped, and a weak sun came out briefly, just for a moment. The lane curved around the long side of last year's corn stubble. As I cycled past, a great wave of rooks rose from the ground and formed a rolling canopy in the sky. I'll never forget it, the icy air filled with their monstrous noise. I freewheeled down into Bruisyard, the pretty village sign like a welcoming beacon, and I stopped beneath it, my breath clouding in the impossibly freezing air. But my fondest memories of Bruisyard are all in summer. Some fifteen years ago, soon after the time my son was born, this village was well-known throughout Suffolk for its vineyard. We would come up here for picnics with friends who lived locally, and walk the lanes in the high heat, my baby son on my back, the world enticing and full of possibility. The high-hedged rolling lanes were like being in France in that heat, what with the vines, and the iconic village sign with its Saint, and the ruin of a calvary beside the road. Now, fifteen years later, I cycle passed that frozen calvary, and remembered. I had not seen a car since leaving Sweffling. There was nobody about - no one was going outside unless they had to. A while later, a man checking his weather station in a garden at Cransford told me that the temperature was minus three, but it felt much colder. There was a deep silence, only the sound of my wheels cutting through the crust of frost, and the occasional bird chased from the hedgerow by my movement. I came down into the village. The vineyard had gone - I already knew this, but I felt a sense of loss as I saw the new houses which had been built there. I didn't look back. I came further down until I reached the lychgate of St Peter's graveyard. The tiny church sits on a little hill, and the door always seems to be open. I walked up the path to the south porch. The beautiful tower contrasts with the simple nave, and the whole piece has been thoroughly restored in the 19th and 20th centuries. However, unlike the overwhelmingly dull Victorianisation of neighbouring Cransford, it looks a delight, the perfect church for such a pretty parish. The south side is punctuated by a long transept, which forms a vestry. As I wandered about the graveyard taking the photographs at the top of this page, it began to snow again. It could have been any time; I thought of the medieval snow which must have fallen for the Sisters of the Poor Clares, who had their first ever English community in this village, which is why it is St Clare rather than St Peter on the village sign. I stepped inside. The interior is simple and white. The church is full of space and silence. There is nothing at all of major historical or artistic importance here - the typically East Anglian font is cracked and recut, the furnishings are virtually all 19th Century - but the atmosphere is delicious, with a sense of continuity, and of the love and care of the current worshipping community. What at first sight appears to be a Big House memorial on the north wall turns out to be the war memorial. This tiny, remote parish lost seven boys to the first war, and two to the second. A curious decalogue set hangs on the wall. It was printed in the 18th century, and coloured in by hand. They must once have been common, and I have come across several in Norfolk, but I don't think ever seen another one in Suffolk. The royal arms is also an amateur effort of the same century, painted on canvas but behind glass in a frame. Icons of St Francis and St Clare flank the cross on the rood beam. Beyond, this is one of the last Anglican churches in Suffolk where it is still possible to light a candle for prayer, and it would be hard to resist doing so, lending our own voices to those of Bruisyard parishioners from before the great Reformation divide and of the long generations since. And then out into the snow.